I opened my Gateway PC (Gateway DX4860-EF22P) to add a hard drive, but I was surprised to discover that the manufacturer did not provide enough room to put the new hard drive. As you can see in the image, it is blocked by the right edge of the tower's frame. 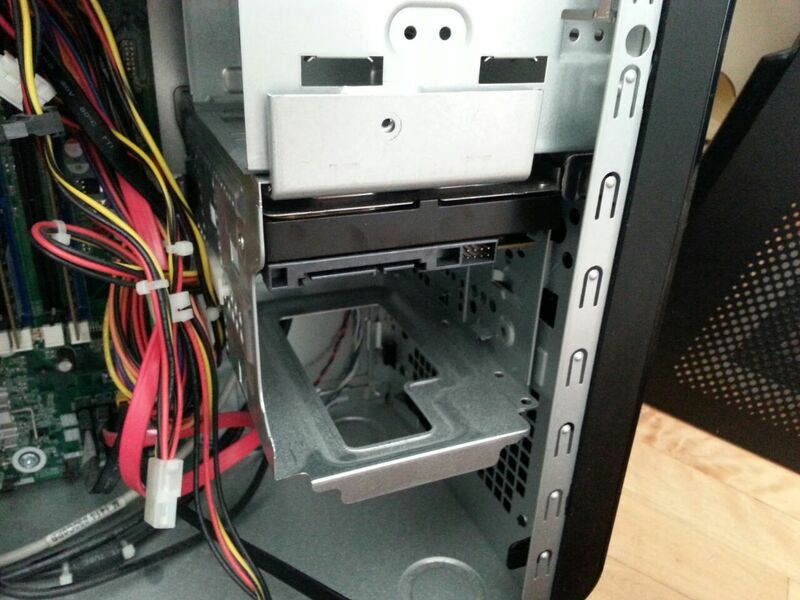 This frame cannot be removed and the box holding the first hard drive can't be removed without completely disassembling the whole tower. Has anyone ever encountered something like this before?? What did you do? The hard drive casing can be pulled forward about an inch, and then released with pressure down and to the left. Now I have the box pulled out. NOTE: In the image above, I already removed a screw in the metal face just above the case. You see the hole in the top center of image. How about a 2.5 inch hard drive instead of a 3.5 drive? Cables with 90 degree connectors would work for power and data. Vent holes along the bay could be used for mounting screws, or just cobble something up for mounting if you're inventive. Not the answer you're looking for? Browse other questions tagged hard-drive sata computer-building desktop-computer or ask your own question. Why doesn't my new computer show video? Windows Vista won't install onto a new harddrive? BIOS doesn't see harddrive — but debian does! Are all of the components on the exposed circuit board of a hard drive necessary? How do I reduce the size of a VirtualBox drive?